I'm preparing for a Tropical storm coming In or Near Tampa bay.........now if it doesn't happen..ok...I was ready and prepared. LargoFL wrote: I'm preparing for a Tropical storm coming In or Near Tampa bay.........now if it doesn't happen..ok...I was ready and prepared. Good Luck Largo and everyone else is pathway of TD #6... Best to prepare for the worst Largo. I know flooding isn't a concern, but I hope those big trees stay put. good morning Billsfan and thanks, yeah it looks like Tampa bay then eastward for this TD-6,just hope no Bad winds..i always watch out for those surprise Tornado's when a storm is coming ashore...well lets see how this plays out thru today..
increasing westerly shear is forecast to prevent intensification. 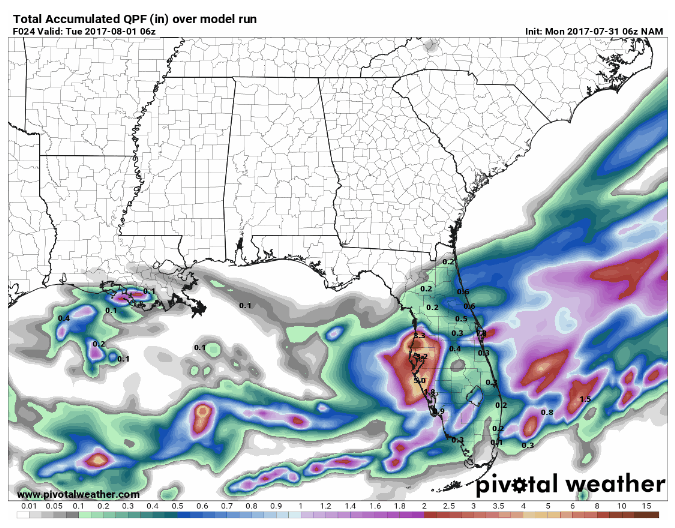 HWRF and GFS solutions, and the slower ECMWF. 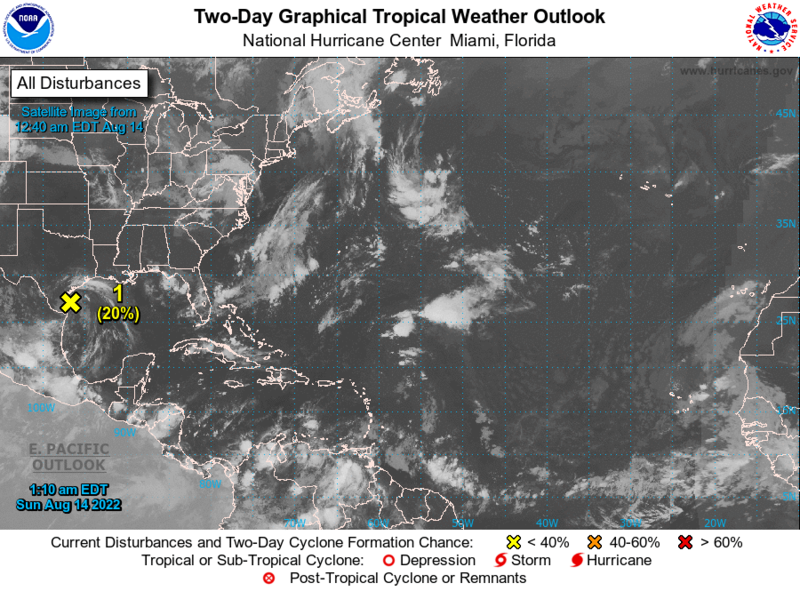 The area of low pressure we have been watching is now Tropical Depression Six. Winds this morning are 35 mph but it would only take a minor increase in intensity to reach tropical storm conditions. As a result, a Tropical Storm Watch has been issued for the west coast of Florida from the Anclote River southward to Englewood. This includes Pinellas, Hillsborough, Manatee and Sarasota counties. A Tropical Storm Watch means that tropical storm conditions are possible within the watch area, in this case within the next few hours. Florida from the Anclote River southward to Englewood. amounts of up to 4 inches possible. Thanks for keeping the coffee percolating, Largo. gee what a difference a day makes huh....hope everyone knows about the coming storm which COULD..strengthen and a surprise TS could appear, don't get caught off guard today..stay safe especially on the roadways today. tropical storm force wind of 39 to 57 mph. may result in serious injury. conditions on bridges and other elevated roadways. - Scattered power and communications outages. conducive for localized flash flooding and rapid inundation. and warnings are issued, heed recommended actions. - Localized rainfall flooding may prompt a few evacuations. become swollen and overflow in spots. shelter quickly if a tornado approaches. You guys can have the fun with TD6. The front cleared up here and it is a nice sunny morning after yesterdays wet and soggy. I ended up with 2.80" for the event and 9.67" total for the month of July. Just 2 weeks ago I was extremely dry still with not much rainfall for the month, then the last two weeks brought me 7.5". Hope everyone fairs well with the storm. waterdipper wrote: You guys can have the fun with TD6. The front cleared up here and it is a nice sunny morning after yesterdays wet and soggy. I ended up with 2.80" for the event and 9.67" total for the month of July. Just 2 weeks ago I was extremely dry still with not much rainfall for the month, then the last two weeks brought me 7.5". Hope everyone fairs well with the storm. thunderstorms today with heavy rainfall possible. Manatee, Inland Sarasota, and Pinellas. locally higher amounts possible in some locations. local media for additional updates and possible warnings. It is official... we have Tropical Storm Emily!! and its sitting just off Pinellas county..oh boy I'm going to get this one here, I can just feel it ......just hope no tornado's or high winds when it comes ashore. St.Pete..you up yet?...we are going to get this tropical storm here today..stay safe down there ok.
Florida from Anclote River southward to Bonita Beach. of the east-central Florida coast early Tuesday. depression while it moves across the Florida peninsula tonight. Naples, moving east at 35 mph. I'm just LOLing at the little storm that could! Never, would I have expected that little pissant Low to become a TS. It is so small and south weighted that it looks like Manatee county will be the beneficiary - much to my chagrin! I've been dry slotted for most of the "event" with a whopping .34" to celebrate! sangria wrote: I'm just LOLing at the little storm that could! Never, would I have expected that little pissant Low to become a TS. and they are saying conditions are good for tornado's..so stay alert and safe ok.
all I'm worried about are all these huge tree's around me....it can rain all it wants..wont bother me much but a tree coming down would...gee. would you pass over Florida and spin up some fish!.. Ignore this Total QPF forecast from NAM - this model is on crack this morning! Largo, I don't think I would worry too much about the wind, although you are a bit further south. Based on the forecast discussion, the wind was measured by "Doppler" and that estimated wind was on the south side. upgraded to Tropical Storm Emily. " LargoFL wrote: all I'm worried about are all these huge tree's around me....it can rain all it wants..wont bother me much but a tree coming down would...gee. Nothing a red neck and a chainsaw can't handle! !..LOL Only problem with tress is if they come through your house.Been there done that! I'm wondering what would happen...if Emily goes into the mouth of Tampa bay?....would flooding be a concern for some area's?? Not anything impressive coming from any of the operating bouy stations or from any ships in the vicinity. Click on the identifier in the far left column and it will open the individual reporting station/ship and provide a map of its location as well as additional measurements. * WIND- LATEST LOCAL FORECAST: Tropical storm force winds remainpossible- Peak Wind Forecast: 20-30 mph with gusts to 45 mph- CURRENT THREAT TO LIFE AND PROPERTY: Elevated- The wind threat has remained nearly steady from theprevious assessment.- Emergency planning should include a reasonable threat fortropical storm force wind of 39 to 57 mph.- To be safe, prepare for the potential of limited windimpacts. Efforts should now be underway to secure allproperties.- Hazardous wind is possible. Failure to adequately sheltermay result in serious injury.- POTENTIAL IMPACTS: Limited- Damage to porches, awnings, carports, sheds, and unanchoredmobile homes. Unsecured lightweight objects blown about.- Many large tree limbs broken off. A few trees snapped oruprooted, but with greater numbers in places where treesare shallow rooted. Some fences and roadway signs blownover.- A few roads impassable from debris, particularly withinurban or heavily wooded places. Hazardous drivingconditions on bridges and other elevated roadways.- Scattered power and communications outages. * STORM SURGE- LATEST LOCAL FORECAST: Not available at this time. To beupdated shortly.- Threat to Life and Property: Not available at this time. To beupdated shortly.- POTENTIAL IMPACTS: Not available at this time. To be updatedshortly. * FLOODING RAIN- LATEST LOCAL FORECAST: Flood Watch is in effect- Peak Rainfall Amounts: Additional 2-4 inches, with locallyhigher amounts- CURRENT THREAT TO LIFE AND PROPERTY: Elevated- The flooding rain threat has remained nearly steady fromthe previous assessment.- Emergency planning should include a reasonable threat forminor flooding where peak rainfall totals are near amountsconducive for localized flash flooding and rapid inundation.- To be safe, prepare for the potential of limited floodingrain impacts.- Localized flooding is possible. If flood related watchesand warnings are issued, heed recommended actions.- POTENTIAL IMPACTS: Limited- Localized rainfall flooding may prompt a few evacuations.- Rivers and tributaries may quickly rise with swiftercurrents. Small streams, creeks, canals, and ditches maybecome swollen and overflow in spots.- Flood waters can enter a few structures, especially inusually vulnerable spots. A few places where rapid pondingof water occurs at underpasses, low-lying spots, and poordrainage areas. Several storm drains and retention pondsbecome near-full and begin to overflow. Some brief road andbridge closures. * TORNADO- LATEST LOCAL FORECAST:- Situation is somewhat favorable for tornadoes- CURRENT THREAT TO LIFE AND PROPERTY: Elevated- The tornado threat has remained nearly steady from theprevious assessment.- Emergency planning should include a reasonable threat forisolated tornadoes, mostly with shorter and narrower damagepaths.- To be safe, prepare for the potential of limited tornadoimpacts.- Listen for tornado watches and warnings. Be ready toshelter quickly if a tornado approaches.- POTENTIAL IMPACTS: Limited- The occurrence of isolated tornadoes can hinder theexecution of emergency plans during tropical events.- A few places may experience tornado damage, along withpower and communications disruptions.- Locations could realize roofs peeled off buildings,chimneys toppled, mobile homes pushed off foundations oroverturned, large tree tops and branches snapped off,shallow-rooted trees knocked over, moving vehicles blownoff roads, and small boats pulled from moorings. residual front. A brief tornado and/or waterspout could occur. Looks like your typical early season TS for the west coast of FL. Not much going on near the center at the present. The band hitting Pinellas down to Sarasota counties looks pretty good. The majority of the heavy rainfall is displaced well south and east of the center, with a large dry slot between it and the center. 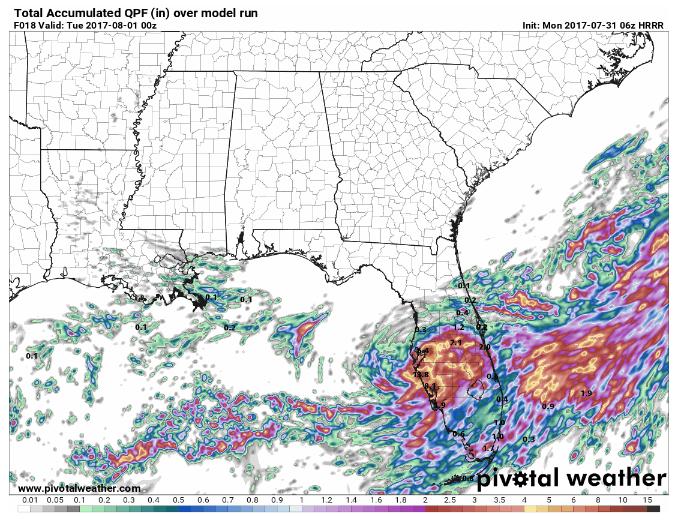 Yesterday the forecast was for this frontal system to move back north and bring a return of the heavy rainfall into north FL. Now with Emily, mets are not so sure. Does anybody think Emily will clear the atmosphere out or will enough energy remain along the stalled frontal system to bring a return of moisture northward during the week? Ignore my sense of humor,after going through Camille,Ivan,Frederic,Opal and Katrina..A sense of humor is what you learn to help you through them..Especially that 2 hours of terror as you go through the eye wall and poke em in the eye! I think I'm with San on this one. Very possibly a disappointment up our way. JRnOldsmar wrote: I think I'm with San on this one. Very possibly a disappointment up our way. Wenniecanes rule!...I do hope you get enough rain to be a drought breaker..
folks remember, the winds in a TS are counter clockwise if I remember right, so even if..the center comes ashore to the south of you...you'll still be the winds and storms all around it, yeah even to its north..lets just stay alert for any surprises and for some folks..this storm will be giving them much needed rain huh...afterwards those living close to rivers and streams may have to stay alert for any flooding concerns I guess. well looks like my area got about an inch and a half rain last 24 hours..now lets see what another 2-4 inches or more will do..glad I don't have to drive anywhere today.